Jasmine (Jasminum spp.) includes about 200 species of plants from Asia, Europe and Africa. These tropical plants reach 8 to 15 feet tall. They remain evergreen in warm climates with green stems and shiny green leaves. The fragrant flowers are produced throughout most of the year. Orange-red fruit pods are rarely produced in cultivation. Jasmines are used as shrub borders, hedges, background plantings and specimen plants. Jasmine plants grow in nearly any type of soil as long as plenty of water is available. 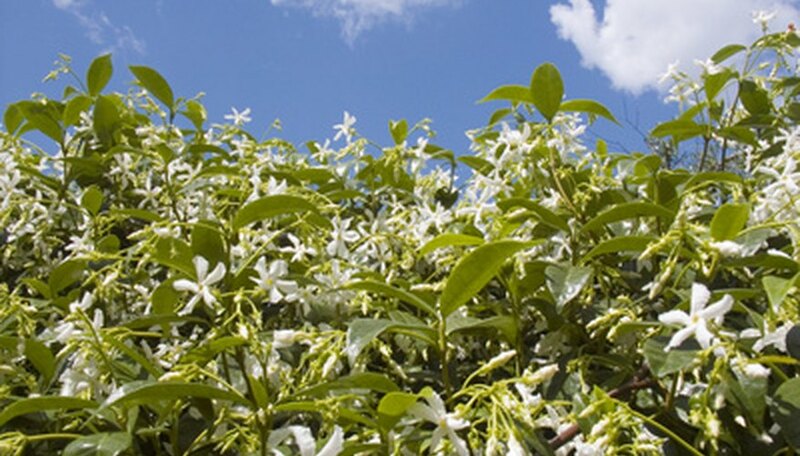 White jasmine is a vine-like type of jasmine with waxy, white flowers. This type is native to the Himalayan Mountains in Western China. Spanish jasmine originates in France, Spain, Italy, North Africa and the Middle East. The blossoms of the Spanish jasmine plants are used as flowers for women’s hairstyles. Crape jasmine is a variety native to Northern India. This type of jasmine is a shrub used to form hedge walls. Jasmine grows outside year round in USDA plant hardiness zones 9 to 11. The leaves stay green and the plants need trimming to stay at the desired size. In USDA plant hardiness zone 8, the jasmine freezes and dies back to the ground. The plant returns in the spring with fresh, new growth. Plants exposed to fall kill-off do not produce blossoms until the end of summer. Jasmine plants are grown inside greenhouses in climates with freezing, harsh winters. Jasmine plants thrive in areas with full to partial sun exposure. The soil for jasmine flowers should fall in the pH range of 4.9 to 8.3. The soil needs to stay moist, but not waterlogged. The best habitat for jasmine plants has an annual rainfall of 12 to 110 inches. Mulching over the root zone helps to conserve soil moisture and reduces weed growth. Jasmine flowers are used in tea and herbals. Flower oil is extracted as soon as the jasmine blossoms are harvested. This oil contains benzyl acetate, terpineol, benzyl benzoate, jasmone and linalool compounds. The jasmine flower oil is used in perfumes, cosmetics, creams, oils, soaps and shampoos. Jasmine plants do not tolerate salty soils or conditions. These flowers can also be infested with whiteflies, scales, caterpillars, nematodes and sooty mold. In area without frost or freezing winters, jasmine can become an invasive plant.